Paper-based records can easily absorb odours from their surrounding environment. These odours can tell a story about how they were housed, how they were used and where they are from. However, it is not often desirable to preserve the scent of records. It may also raise concerns regarding whether or not the cause of the odour is contributing to increased degradation of the records. 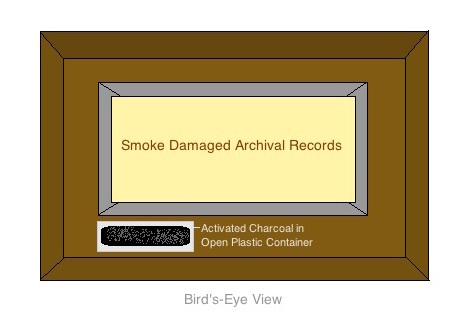 A frequently encountered issue is removing the scent of smoke from records, whether caused by tobacco or by fire. This guide will introduce non-invasive and invasive methods of removing odours caused by smoke from paper-based records. Absorb: Absorbing is the process of a liquid entering (being absorbed by) a solid or another liquid. Adsorb: Adsorbing is the process of one substance being attracted to, and chemically bonding to another substance (adsorbent). There are substances that can be housed with the contaminated box of records that will adsorb the odours that are being emitted. These substances eventually lose their effectiveness and must be replaced. 1. Activated Charcoal is a successful method of deodorizing, often used to deodorize carpeting. Activated charcoal is charcoal that has been treated with oxygen causing tiny spaces to open up around carbon atoms. This causes the charcoal to be chemically unstable and attract organic molecules in the surrounding environment. (1) Once it adsorbs the molecules it becomes chemically stable, making it no longer active. At this point, if the odour persists, the charcoal must be replaced with new activated charcoal. How to use it: Take the lid off of the Hollinger box of smoke contaminated records. Put the box into a larger box. Place the activated charcoal in small cotton bags or a small open plastic container and place in the larger box; it should surround the Hollinger box. Put the lid on the larger box only (not the Hollinger box). (2) The activated charcoal will adsorb the smoke odour from the environment. 2. Baking Soda is an extremely cost effective way of removing odours. It is often used as a household cleaning product. It is safe for staff to work with, and does not pose a risk to records. It is less effective at deodorizing than activated charcoal because it works better when in direct contact with the item emitting the odour. How to use it: Take the lid off of the Hollinger box of smoke contaminated records. Put the box into a larger box. Place the baking soda in a small open plastic container in the larger box. Put the lid on the larger box only (not the Hollinger box). The baking soda will remove some of the odour in the surrounding environment. It will need to be changed out frequently to continue adsorbing the smoke odour. Where to buy it: Baking soda can be purchased at grocery stores in the baking aisle, or in the cleaning or cooking section of drugstores. It is recommended to get the largest size because the plastic containers of baking soda will need to be changed out often. Where to buy it: Look for pet litter made with zeolites at pet stores. It is recommended to change out the zeolites if the smell continues to persist after a couple of weeks. MicroChamber® paper can be purchased through Carr McLean. Surface cleaning paper-based records to remove odours can be completed in the same fashion as removing mould from paper. Note: If surface cleaning does not remove the odour, contact a conservation professional who will be able to complete more complex treatment methods to remove odours. 1. Absorene Dirt Eraser was originally made to remove soot from wallpaper. It is a helpful surface cleaning agent when removing large amounts of soil from paper. It is made of vulcanized rubber, it is spongy, and has many pores that collect accumulated soil. How to use it: To surface clean paper records in an effort to deodorize, first cut cubes of Absorene Dirt Eraser. Place a soft weight on one edge of the document to hold it down while working. Slowly work a cube of Absorene from one of the top corners, moving down the paper, and then starting at the top again. Avoid any media that can easily be abraded or smudged including graphite, toner, and art media. Both sides of the paper will need to be cleaned with Absorene to deodorize the item. Please see the Flood Advisory Programme’s how-to video on removing mould for a 3-minute video on surface cleaning. Where to buy it: Absorene Dirt Eraser can be purchased at Carr McLean (found as Dry Cleaning Eraser), Brodart, Amazon, and Gaylord Archival Supplies. It is imperative to purchase the Absorene Dirt Eraser block, not Absorene Paper and Book Cleaner, because they are not the same product. Absorene Paper and Book Cleaner, which has a putty-like texture and is housed in a bucket, can leave an oily residue. How Stuff Works: Science, What is activated charcoal and why is it used filters?, http://science.howstuffworks.com/environmental/energy/question209.htm, (2016). Northeast Document Conservation Centre. Frequently Asked Preservation Questions, Ask NEDCC. https://www.nedcc.org/free-resources/ask-nedcc/faqs, (2016). Jason Fitzpatrick, Use Charcoal Briquettes for Cheap and Non-Toxic Odor Removal, Life Hacker, http://lifehacker.com/5644007/use-charcoal-briquettes-for-cheap-and-non-toxic-odor-removal, (Sept. 21 2010). Chris Woodford, Zeolites, Explain that Stuff!, http://www.explainthatstuff.com/zeolites.html, (Mar. 10 2016).